About The Book The Penguin History of Early India: From The Origins To AD 1300 is a rewritten book that brings India's vivid past into the limelight. It is a kaleidoscope of various cultures and the colourful history of this unique country. It takes us on a ride and gives us an idea about India's past from the formation to the emergence of India as a great nation. The objective of this book is to tell the story of India like never before. It takes readers back to the prehistoric era and compares the religious practices and beliefs, as well as the economical status and lifestyle pattern of people during various periods. It continues by telling us about emergence of great dynasties like the Mauryas, Cholas and Guptas and how they contributed in the development of glorious history. It tells us about the creation of great epics and it also talks about the lives of various scholars and saints and how they played a role in shaping the lives of their followers. This book ends with the narration of events in 1300 AD, with the reign of the last Chola ruler Rajendra III. 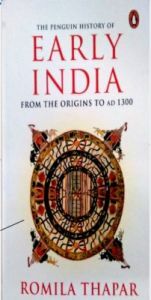 This is an updated edition of The Penguin History of Early India: From The Origins To AD 1300. It contains information about the history of India based on modern methods of interpretation of historical data, thereby providing us with refined knowledge and data on various historical events. Key Features This book is about India's varied history from its formation to the development. It focuses on the emergence of various dynasties and their contributions. It tells us about various scholars like Gautam Buddha and King Ashoka and saints and epics like Ramayana and Mahabharata. About the Author: Romila Thapar is an Indian historian. She graduated from Punjab University and obtained a doctorate degree from the School of Oriental and African studies from the University of London. Her prime area of study and research is ancient Indian history. She has won many awards for the contributions made in the field of history.